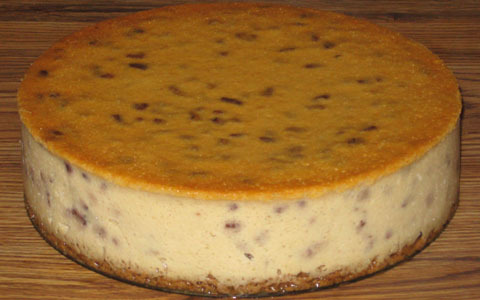 After earlier efforts of combining pecan filling with a few pumpkin cheesecake varieties, I decided to make a cheesecake that featured pecan in its own right. I modeled the batter for this one primarily after Prototype 6 of my pumpkin cheesecake (although I decided to use a plain crust here). Prepare ahead of time 2 pounds of yogurt cheese, derived from two 32-ounce containers of nonfat yogurt. If the resulting yogurt cheese falls below 32 ounces, add back enough of the whey (that was strained out from the yogurt) to make up the difference. To this yogurt cheese combine 16 ounces (1 pint) of whipped, lowfat cottage cheese. Combine all the pecan filling ingredients in a saucepan before heating. Stir constantly over a roughly medium heat (not high—otherwise the mixture can easily leave a sticky, burnt residue on the bottom of the pan), bringing the mixture to a mild boil. Stir and cook carefully for about another 5 minutes, then remove from heat. Let this mixture sit until it is time to add it to the cheesecake batter (at which point the filling should still be at least warm enough that it spreads very easily). Pour this crust mixture into pan (9 to 9 1/2 inches) and pre-bake without tub at 300 degrees for 10 minutes, then cool enough to comfortably touch at least the pan's upper sidewall. Carefully wrap the pan in heavy foil afterwards (do not wrap it earlier—otherwise, this increases leakage risks). Pour on top of crust. Bake in tub at 300 degrees for 105 minutes (if using a 9 1/2" pan). Then cool down while still in oven (with this oven shut off) and in tub with door slightly ajar for an hour. Afterwards, remove from oven and tub and continue to cool down at room temperature for another 105 minutes, then remove from pan and refrigerate. I maxed out the springform pan's capacity on this one. 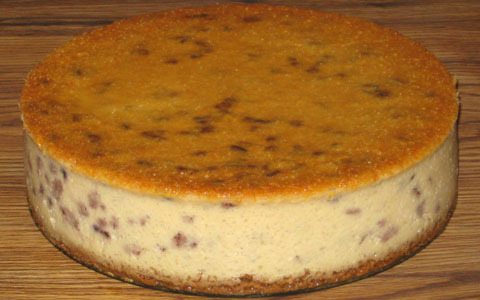 The top surface of the cheesecake had a well-done look to it. But when this cheesecake was cut, it was rather quite soft on the inside, somewhat like many of my eggnog pumpkin prototypes. But I was able to pick up a satisfactory presence of the pecan-pie-like flavor (I more readily sensed the cheese taste). However, I felt that I should have perhaps reduced or cut out the cinnamon from the crust (as long as the cheesecake was pecan only). I served this prototype at Living Hope Church on a Sunday when the turnout seemed quite low. About 1/4 of this cheesecake was left. It was served among a modest selection of refreshments. For this one, the crust's cinnamon was reduced (I forgot to also decrease the brown sugar here, in keeping with the cinnamon reduction). I also made some adjustments in hopes of firming up this cheesecake, yet avoiding an overcooked top surface. Pour on top of crust. Bake in tub at 300 degrees for 90 minutes (if using a 9 1/2" pan). Then cool down while still in oven (with this oven shut off) and in tub with door slightly ajar for 90 minutes. Afterwards, remove from oven and tub and continue to cool down at room temperature for another 2 hours, then remove from pan and refrigerate. I felt that this cheesecake was still too soft, but (hopefully) not quite as soft as the previous prototype. And the top did not seem overdone this time. I served this latest cheesecake at Living Hope Church after a Sunday service which featured baptisms and testimonies. Although there was a good-sized turnout, about a quarter of Prototype 2 was left over (just like Prototype 1). A good selection of other baked goods, plus other snacks, were available as well.